A little bit of thatch is actually good for our lawns – about half an inch helps insulate roots, retain moisture and improve your lawn’s resilience under foot traffic. Too much though, and it can start choking up the grass, keeping moisture, air and nutrients from getting at roots and properly allowing your lawn to flourish and grow. Dethatching becomes necessary here, but for it to be effective, you need to pick the right tools. For smaller lawns, and milder cases of thatch – say, about an inch thick – investing in power rakes or electrical dethatchers is wasteful and disproportionate when a simple thatch rake will suffice. Thatch rakes put the least amount of strain on your lawn during the dethatching process compared to other dethatching alternatives, like mechanical or tow behind dethatching, which is always a good thing considering that dethatching does inevitably disrupt grass growth and needs to be undertaken carefully to ensure your lawn can quickly recover from it. Which is why your typical leaf or grass rake isn’t going to cut it. A good thatch rake lets you get into the thatch with the same raking motions you’d be using with a normal rake, the curved tines designed to sink into the thatch layer and tease it out to the surface to be removed later with a regular rake or other tool. Properly done, and you can carry out the operation without damaging or digging out roots in the process. Though of course requiring more muscle work from you than a tow behind or electric option would – so we would not recommend this for anyone who may have trouble with excessive physical exertion or is planning to dethatch anything more than a small lot of land – having a good thatch rake at your disposal is an inexpensive and quickfire way of tackling thatch trouble before it gets too serious. Take a look at our picks for the best dethatching rake. 19 self cleaning, sharp tines let you clear out swaths of 15 inches as you rake through matted grass and dead plant matter without pulling out or damaging growing roots, one side of the tines crimped to loosen and prep soil for reseeding after dethatching, while the other is shaped to run parallel to the ground and grab loose bits of debris and weeds, helping clear out your lawn as you work. 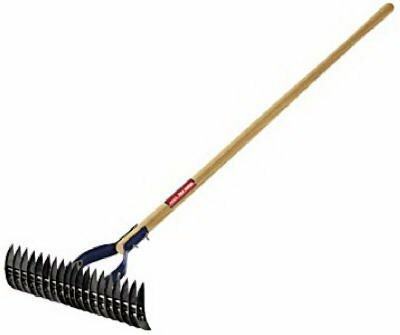 Though the purpose of this rake is not to clear out weeds and creepers or rake grass (much as a grass rake can’t tackle thatch), this is a great, sturdy and user-friendly garden implement to have on hand to keep the instances of thatch accumulating in check from the get-go – as long as you’re mindful, you won’t have to bring out the big guns and hire a power rake or a lawn maintenance professional to do it for you. We love the fact that the 54 inch long wooden handle is adjustable, letting you work out what is most suitable for you to work with and avoiding risking any awkward aches and pains. A cushioned end grip for this 54 inch rake handle makes working with the tool more comfy and gives you better control, the 19 sharp steel tines letting you clear swaths of 15 inches as you rake. The curved teeth of the tine loosens up soil and preps it for cultivation, letting air, moisture and nutrients reach the roots of growing grass and giving your lawn the boost it needs to bounce back after a dethatching session, while the straight teeth cut into thatch and loosen it out to the surface where it can be collected and disposed of. 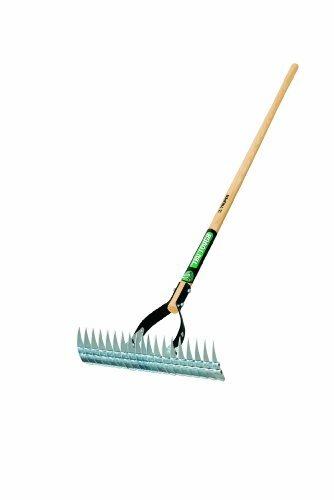 Many users also use this rake to double as a deweeding unit to tackle moss and light brush. With a 15 inch wide head to clear out reasonable swaths ideal for small lawns and minor thatch problems, the unit features 19 self cleaning tines to easily pick up dead and matted plant matter and comb it out to the surface for removal, without snagging or damaging roots. The curved tines help remove the dead matter, working the soil loose to let air, water, nutrients and so on work into it and reach the roots to enable your grass to grow healthily, as well as priming the soil for new seeds to be planted, the angle of the head adjustable depending on your dethatching needs. The 10 inch cushioned end grip makes working with the unit easier, letting you have better leverage as you pull out the thatch in your lawn without risking giving yourself blisters, a durable and springy hardwood handle promising longevity and sturdiness in use. The lacquered North American ash handle, 54 inches long as with the rest of the units of this list, is resilient and sturdy to let you get in a good grip and many uses for thorough dethatching, 19 sharp and self cleaning tines combing through matted grass and plant matter to scoop it all out while keeping the damage done to your growing grass on the down low. The head is clear coated and with a gray steel finish for high durability, clean up as simple as a hose down under your garden faucet. The adjustable head angle lets you adapt the unit for your height, the type of raking motion you are using, and so on, to make the process more comfortable; the angled edge of the tines on one end is ideal for pulling out loose thatch, while the flip side is better suited for getting at more deeply embedded thatch.